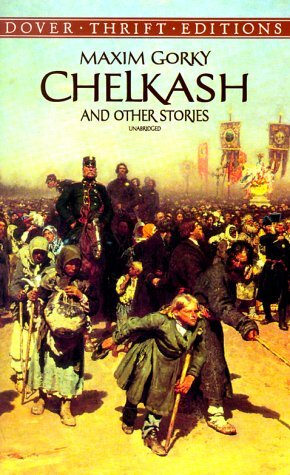 Three short stories from the great Russian writer, including the title story, in which a thieving vagrant takes on a young, unwilling apprentice; "Twenty-six Men and A Girl," widely regarded as Gorky’s best short story, which describes how a wretched crew of bakery workers destroy their only source of joy; and the ill-fated romance, "Makar Chudra." outcasts---the hobos and the drifters---and helped to popularize such literary protagonists. Foma Gordeyev (1899), Gorky's first novel, depicts generational conflict within the Russian bourgeoisie. A popular public figure on the left, Gorky was often in trouble with the tsarist government. During the 1900s, he was the central figure in the Znanie publishing house, which produced realist prose with a social conscience. Some of his own works were extremely successful. The play The Lower Depths (1902), set in a poorhouse and a strong indictment of social injustice, was not only a staple of Soviet theater but also influential in the United States. Eugene O'Neill's The Iceman Cometh was influenced by it. The propagandistic, extraordinarily influential novel Mother (1906) presents an iconic working-class woman who is transformed into a saint of the Revolution; its optimism in the ultimate triumph of the cause made it a prototype of socialist-realist fiction. During the years prior to 1917, Gorky published a number of autobiographical stories: All Over Russia (1912--18) (also Through Russia) and his memoirs; My Childhood (1913--14), My Apprenticeship (1915--16), and My Universities (1923). This trilogy shows his art at its best and includes some very lively reminiscences of such writers as Tolstoy and Chekhov. Although a Bolshevik party member since 1905, Gorky strongly criticized the new regime after the October Revolution: His collected articles from 1917-18, Untimely Thoughts, remained unpublished in the Soviet Union until recently. A cultural activist, he helped to save the lives of many writers, artists, and scholars during the cold and hungry years of the civil war. In 1921 he left Russia for Italy but returned permanently a decade later, recognized as the grand old man of Soviet literature. He then worked for Stalin's economic policies and presided over the institutionalization of socialist realism. At his death, he left unfinished a major novel of considerable interest, The Life of Klim Samgin, which he had been working on since 1925.